A few years ago, we featured J.R.R. Tolkien's personal cover designs for the Lord of the Rings trilogy, a series of novels that justifiably made his name as a world-builder in prose (and occasional verse), but rather overshadowed his output as an illustrator. 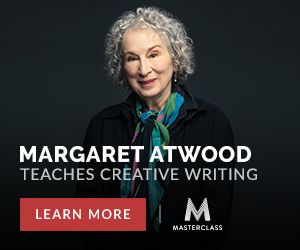 He didn't just do covers for his own books, either. You can get a sense of the breadth of Tolkien's visual art at the Tolkien Gateway's gallery of over 100 images by Tolkien, which reveal the landscapes, letters, interiors, and animals within the creator of Middle-Earth's mind. Many of these images come with descriptions of their provenance, which you can read if you click on their thumbnails in the gallery. 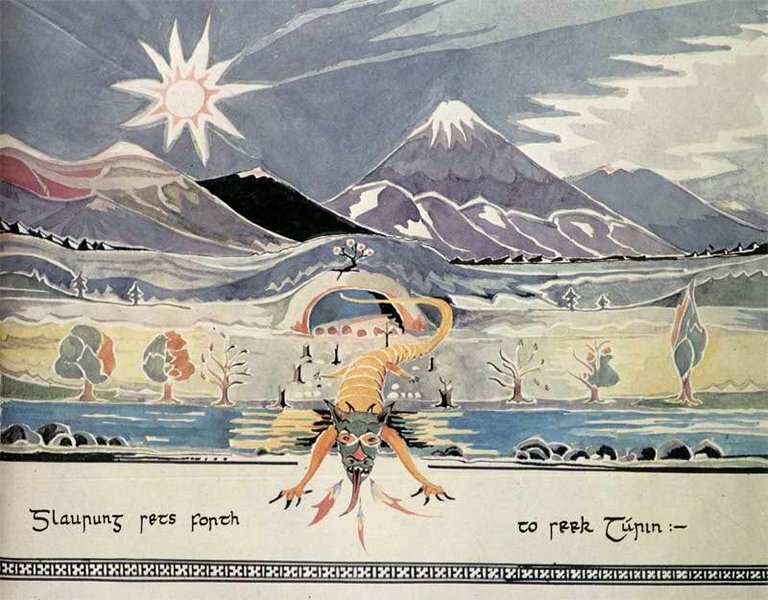 At the top of the post, you'll find Tolkien's 1927 painting Glaurung Sets Forth to Seek Turin, first published in The Silmarillion Calendar 1978. We also have here Tolkien's crayon drawing of the West Gate of the Moria, a scene described in The Fellowship of the Ring as follows: "Beyond the ominous water were reared vast cliffs, their stern faces pallid in the fading light: final and impassable." 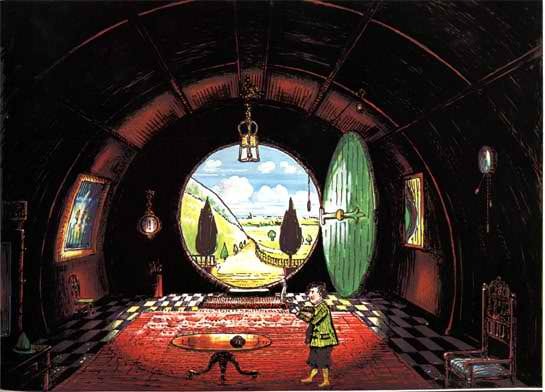 Just above is Tolkien's rendering of Bag-End, residence of a certain B. Baggins, Esquire, "coloured by H.E. Riddett and first published in the English De Luxe edition and in a new edition of the Dutch translation (both 1976) of The Hobbit." 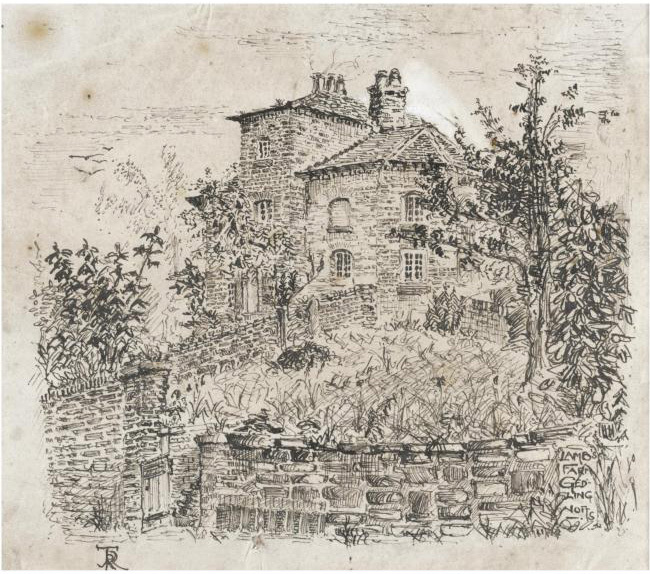 Just below, you can see his 1911 sketch of the much less fantastical Lamb's Farm, Gedling. Beyond perusing the images in the Tolkien Gateway, you'll also want to have a look at Wayne G. Hammond and Christina Scull's book, J.R.R. 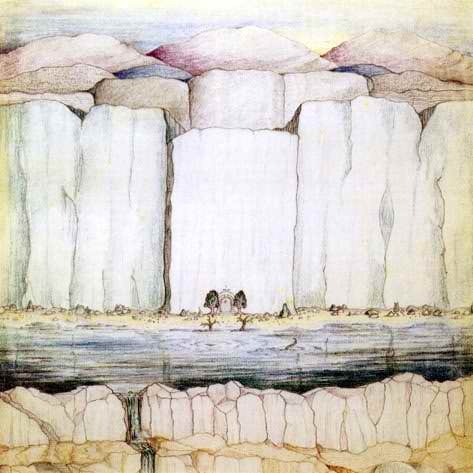 Tolkien: Artist and Illustrator. Some Tolkien enthusiasts will, understandably, prefer to keep their personal visualizations of the Lord of the Rings universe unsullied by non-textual imagery such as this, but if all of Peter Jackson's megabudget film adaptations didn't sully you, then Tolkien's mild, almost rustic but still solemnly evocative drawings and paintings can only enrich the Middle-Earth in your own mind. The artwork certainly adds to the classic stories by Tolkien: the Hobbit to the Lord of the Rings and the Silmarillion. The art and the maps help inspire the imagination while reading. Mike M.
Isn’t the first drawing in this artikel made by Tove Jansson, the moomin author? She drew many pictures for his books. No, the Glaurung_sets_forth_to_seek_Turin image was done by JRRT. Where are the other 106 drawings?